Julius Caesar of Rome was assassinated in 44 BC and Kharavela, a scion of Mahameghavahana dynasty was anionted as King of Kalinga (Orissa) in circa 40 BC. In the history of then world, Kharavela might not have earned the rank that Caesar had but he was certainly one of the great luminaries among the rulers of ancient India. His career, although meteoric, was eventful and glorious. He ranks very high in the annals of history as a conqueror, a benevolent ruler and as a patron of religion, art and culture. 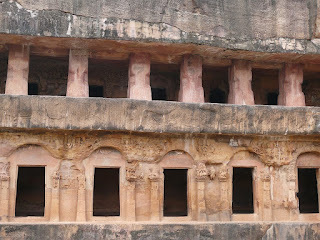 Kharavela being a Jaina priests and for their peaceful meditation and rest, he had caves excavated. 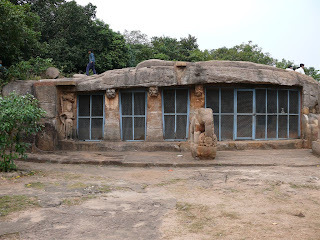 The famous inscription of Kharavela, which is engraved on one of these caves, known as the Hatigumpha, is a unique historical document that throws considerable light on the early history of Kalinga and India in the 2nd century BC. Sterling, who visited the caves in the early part of the 19th century, records a legend which says that the isolated hills formerly constituted a part of the Himalayas at which time they were inhabited by numerous rishis (ascetics) who dug the caves now found in them. They were taken up bodily - masses of rock, ascetics and all - by Mahavir Hanuman to build a bridge to Lanka for Rama but by some accident they were allowed to drop in their passage through the air and they fell in their parent position. There are in all three dozen chambers cut out of the coarse sandstone hills, there are little rock-cut hermitages - cells in which a single ascetic could dwell and do penance. 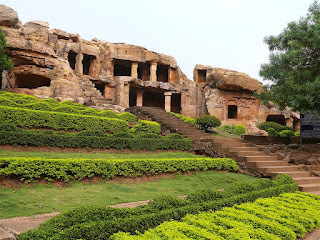 The caves were excavated not by following any systematic plan but in places of most convenient approach and were connected with paths still traceable. 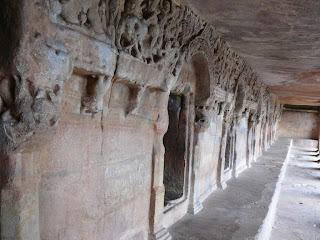 Although the workmanship of these caves are not of the class of Ajanta and Ellora, these caves have many unique features. One such feature is the water supply system by cisterns to each cave dwelling. 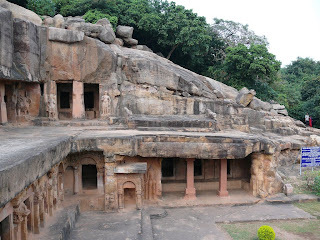 The other architectural feature of these caves are the open courtyard in front of the pillared verandah which could be the earliest known amphitheatre of India. The pillars have simple sqare shafts with braket capitals. Some chambers have stone benches, perhaps used as stone seats or beds. 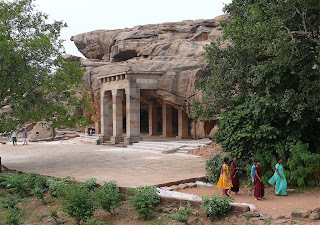 The famous Rani Gumphas (Queen's Cave) in Udayagiri is a double storied monastic retreat and the chambers are situated on three sides of an open quadrangle. Some of these were meant for open religious gatherings. This is proved by the discovery of the throne of stone on the second storey which was perhaps meant for the chief priest. At both the storeys there are sculptural friezes depicting many scenes such as the king with a woman fighting elephant herds, a man and woman in a fight with the man conquering and lifting her. 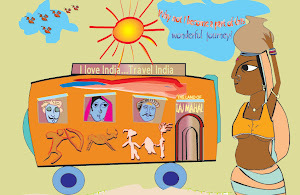 This scene, according to the legend on the East Coast depicts King Ashoka carrying Karuvaki, the princes of Kalinga after the Kalinga War. Besides, there is a scene of royal hunt. In the lower storey there are interesting life-size figures of dvaparapalas (guards) resembling Sythian soldiers armed with spears. All in all, the carvings show popular legends, historical scenes and religious functions as well as many dancers. 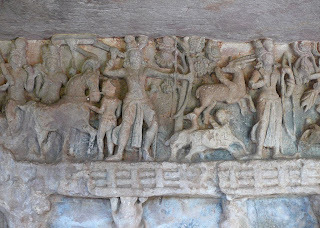 The panels in this multistoreyed cave depict various mood of performing dance and music. 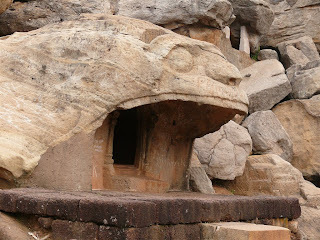 Among other noteworthy gumphas (caves) is the Hatigumpha (Elephant cave) with its famous inscription of Kharavela. 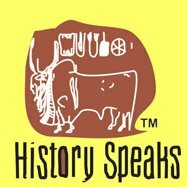 From the inscription we learn much about Kharavela's military exploits and also that his royal city had gate towers, bathing and drinking water tanks and was the scene of formally organized music and dance performances as well as sporting and social events. The city, according to the inscription, "was made to dance with joy". Kharavela was evidently a skilled musician and it seems as if created a remarkable centre for the arts. 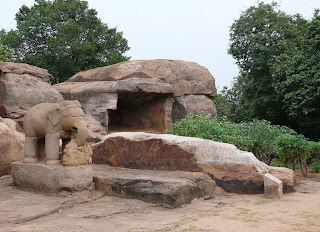 The Ganeshgumpha is also a very important cave of Udayagiri and is named after the figure of Ganesh. 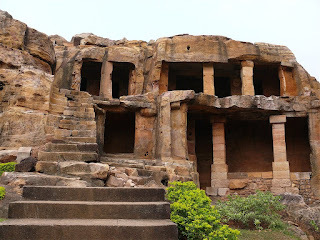 There are about fifteen small and big caves in Khandagiri such as Tatwa, Navamuni, Tentuli and many others which are in a damaged condition. But the best specimen is the Ananatagumpha, which has a pillared verandah. The sculptural decorations on the verandah wall include railing designs., vidhyadhara, three-headed naga figures, rossets and various animals like lions, tigers and elephants. There are also celestial beings like the representation of the Sun God on a two-wheeled chariot drawn by four horses. There is a Gajalaxmi holding a lotus. 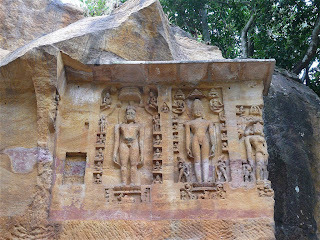 The Jainas believe that Rsabhadeva, the founder of Janinsm and Adinatha, the first Jaina tirthankara visited the hills. The Hatigumpha inscription shows a reference to the fact that a Nanda King carried Kalinga Jina away from Kalinga. Scholars associate this Kalinga Jina with Rsabhadeva who might have been designated as Kalinga Jina, a well reputed and established deity of Kalinga long before the 6th century BC when, Mahavir, the last tirthankara of the Jaina tradition appeared. For the unusual importance of the deity, it was possible that a Nanda later took away this image as a war trophy to pronounce the victory of Kalinga. 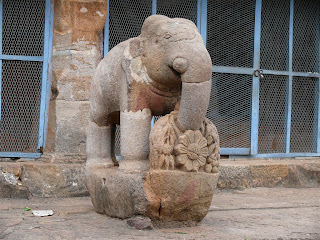 It was brought back by King Kharavela after defeating the King of Magadha.